Ponds, time and place. A Druridge Bay Northumberland blog: No vultures at Druridge Bay, but a trip to Martian Spain finds some familiar plants. No vultures at Druridge Bay, but a trip to Martian Spain finds some familiar plants. Pete, Scott and I have had the great good fortune of a trip to Huesca, in northern Spain, for the 6th European Pond Conference Network meeting. Huesca retains its romano-medieval feel, as if the heat has kept it from expanding beyond the old city walls into the deserts to the south or Pyrenees foothills to the north. Take the desert road south and you come to the county of Monegros, which looks ideal as a film set for Star war’s Tatooine, but instead is known for its spaghetti westerns. The roadside services even affect a wild-west feel with wood balustrades and canopied terraces from which to keep an eye of strangers riding into town. There are at least 140 saline wetlands, called “salades”, pock marking the terrain, largely the result of solution of the limestone and gypsum topography, with the wind also blowing out the hollows. 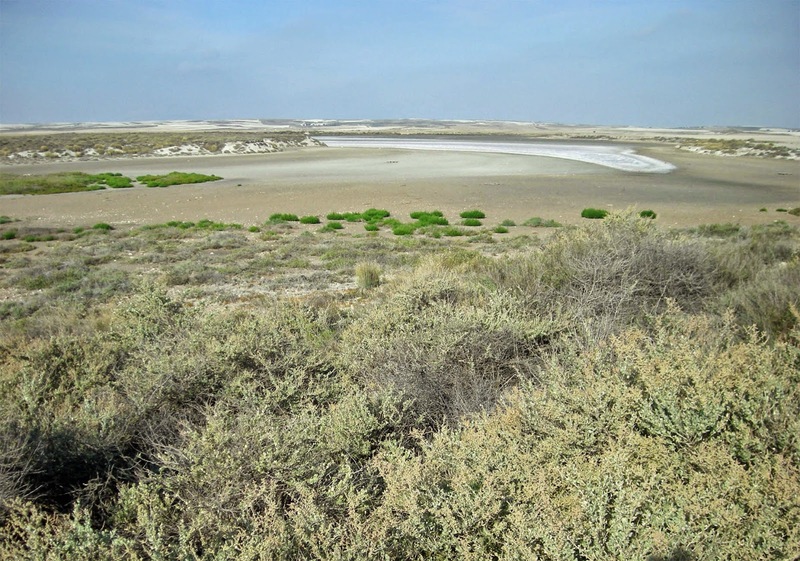 The aquifers are saline too, the hydrology and topography creating a remarkable scatter of salt wetlands deep inland, many of them part of a Natura 2000 designation. They have characteristic vegetation, salt loving xerohalophytes (dry and salt loving), including Atriplex species higher on the edges around the dissolved out drepessions, then distinct zones down to Salicornia patula as the final outpost before the salt crust. The Atriplex are the shrubs in the photo foreground above, the Salicornia the bright green clumps before the open expanse of the salades floor. If you walk down below the line of bluffs around the salades the further horizons cannot be seen and it is easy to this could be Mars with a little bit of gentle terra forming. The fine sediment crusts of the hollows are loaded with the eggs of specialist crustacean such as fairy shrimps, waiting for the rains, and vivid red darter dragonflies perch like sundials on the crackling vegetation. Superficially all very different from the verdant greens of north-east England’s coastline, with its sea frets and northern winds. However Atriplex and Salicornia are familiar species along our coast. Different species, yes, but the same zonation with Salicornia the outer pioneer on salt marshes at Holy Island and Alnmouth, whilst Atriplex species are all along the coast and in the fields at Druridge. However, in Northumberland, no vultures drifting casually overhead though, keeping half an eye on the unwary salades tourists, in we became mired in the cracking salt crust.